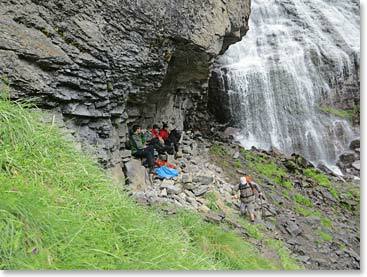 "Your total trip experience gives one a chance to really see Russia and still have a great climbing experience. The three days in St. Petersburg, plus the midnight train to Moscow and the day or so there adds so much value to the trip." Day 2 – Arrive in St. Petersburg. 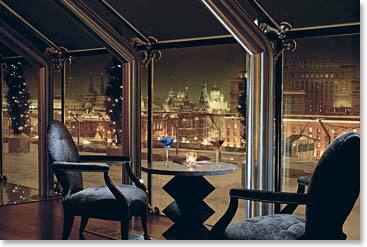 Transfer to first-class hotel in St. Petersburg, the Hotel Nevsky Palace. We will have a team meeting in the evening. Day 3 – We take all day to tour some of the sights in this fascinating centre of culture and history. Spending long summer days in this beautiful city, at 60 degrees north, will be an unforgettable experience. 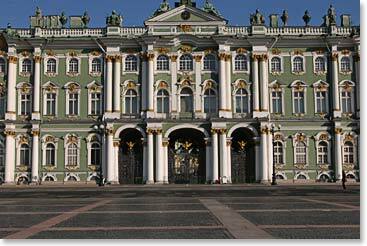 Peter the Great's "Window to the West" still holds all the vibrant energy of a cultural and social conduit. The shell-pocked buildings from the Siege of Leningrad sixty years ago are reminders of a grim and dangerous past. Young people walking along the sidewalks near the Hermitage, performance-art venues, and museums at every turn show us enduring and sophisticated civic will. After an exhausting day, we board the "Night Train to Moscow" in the still-light midnight sky. 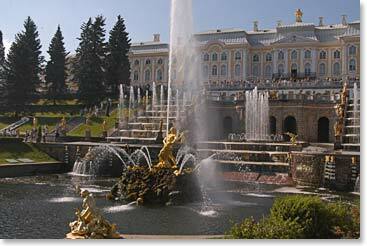 Our first full day in this beautiful city will be spend touring the famous sights like the Peterhof Palace. 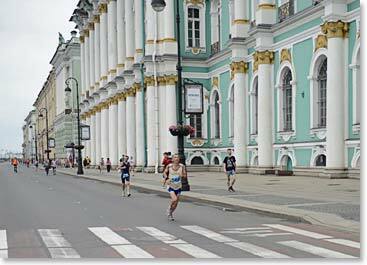 Climbers also have the option of running the “International Ergo White Night’s Marathon” which takes place every year on our tour day of St. Petersburg. Day 4 – After a short night of rhythmic rocking on the rails in our cozy beds, we are met by our Russian Moscow friends. Coffee and an early morning trip to the Kremlin, or a stroll through one of the fascinating and scenic sections of the city might be in order. In addition to the excitement of being at Red Square, we will be trying to keep our tourist pace relaxed enough that we can begin to prepare for climbing in the Caucasus. Day 5 – Morning flight from Moscow to Mineralnye Vody, our gateway to the Caucasus Mountains. 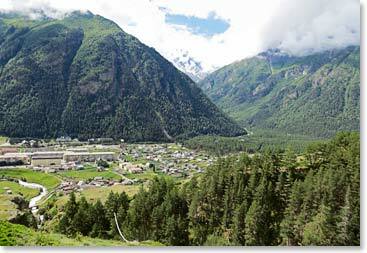 We will then have a 4-5 hour private bus transport to Terskol in the Baksan Valley, the "Russian Chamonix". Our base here will be in the finest lodge in the valley. 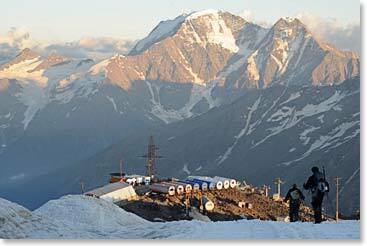 On our previous Elbrus expeditions we have been pleased with the spacious rooms, the quite locations, and excellent meals. Day 6 – First acclimatization day. We take a short bus ride to Djantugan climbing base. 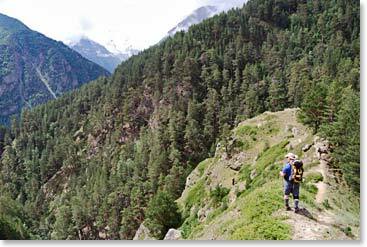 We will then stretch our legs on a steep winding path through the forest to a high moraine; with impressive views of the Kashkatash Icefall and the high peaks of the Main Caucasus Range. 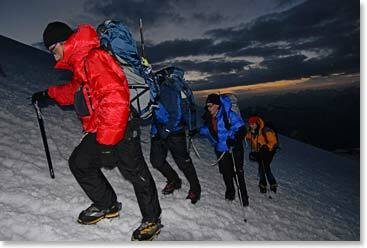 We can descend to a glacier for some crampon practice. Return to our lodge. Day 7 – Today we will acclimatize by riding the chairs at the Cheget ski area to high mountain trails that traverse beautiful ridges. If the day is clear we will have inspiring views of Mt. Elbrus’s twin summits. In the afternoon we can ride the chairs back down to save our knees. Once we are down, we can enjoy eating local barbeque dishes at our favorite outdoor restaurant in the ski base area. Day 8 – Today we venture further up the glacial valley that leads from Djantugan toward the high peaks on the border of Georgia. Besides visiting lovely mountain meadows made green by glacial melt, there are excellent areas to practice glacier walking skills. This day may be a long one, so the sauna back at the lodge will feel especially nice that evening. A great place to stop for lunch! Day 9 – Today we ride two gondolas and a chair lift to Garabachi Base on the slopes of Elbrus. 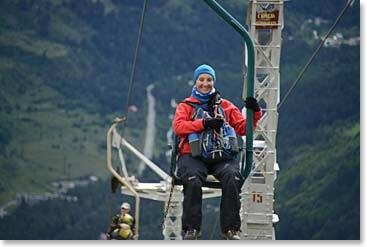 The thin air at 13,000ft/3,962m will be invigorating! We return to the lodge and saunas in the evening. Day 10 – Today we move up on to Mt. Elbrus. Two cable car rides take us to Mir Station 11,484ft/3,500m. 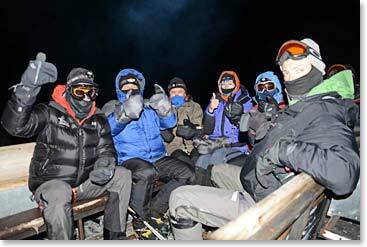 Then a short chair lift ride and we arrive at the Garabashi Huts, also known as "the Barrels" (12,304ft/3,750m). 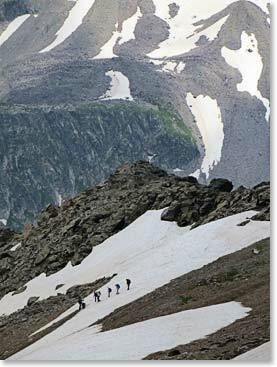 A couple of hikes on the glacier in the afternoon will aid in acclimatization. The Barrels have been a favorite home for BAI climbers over the years-they are quite cozy! Our Russian cook will travel up with us to prepare meals while we climb. Day 11 – Acclimatization hike to Pastukhov Rocks (15,585ft/4,750m). Return to the Barrels where our cook will have excellent afternoon snacks prepared for us. 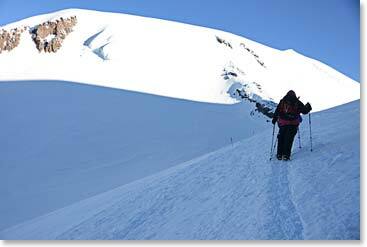 This is an important conditioning and acclimatization day for our planned ascent of Elbrus. 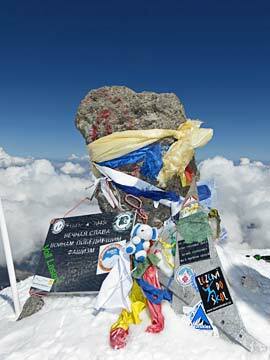 Day 12 – First possible summit day. Option of taking snow cat to Pastukhov to begin the climb. Likely departure time, 2:00-3:00 AM. 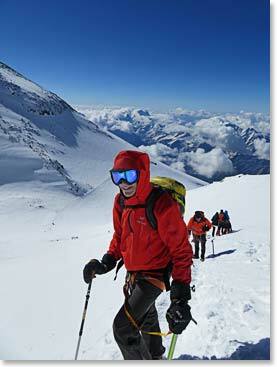 Elbrus summit day is long and we will move with the support of 3- 4 Russian guides as well as a North American guide. Our cook will remain at the huts and keep radio contact with us throughout the day. Day 13 – Alternate summit day. Day 14 – Return to the valley, farewell to the Caucasus party with our friends. Day 15 – Bus to Mineralnye Vody and return flight to Moscow. On our last night together, we will enjoy a return to the city for our last night in Russia, at the luxurious Park Hyatt hotel, steps away from Red Square. Day 16 – Return flights to North America.